On show a selection of Gaetano Zampogna's latest work entitled Mata and Grifone. The works consist of nine large paintings (180x130 cm / 280x130 cm) and nine small/medium paintings, all completed on printed fabric. Zampogna's new collection is the work of a visionary. 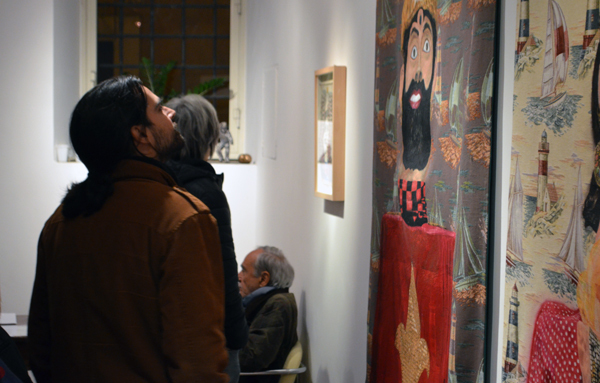 The paintings become large visual machines with Mata and Grifone, the mythological founders of Messina (Italy), as their protagonists. 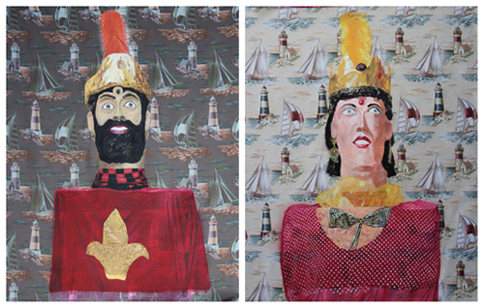 In both Sicily and Calabria, the places where Zampogna spent his childhood, it is customary to parade paper mache impressions of the two giants (represented as a caucasian woman and a moore) through squares and streets during town festivals. 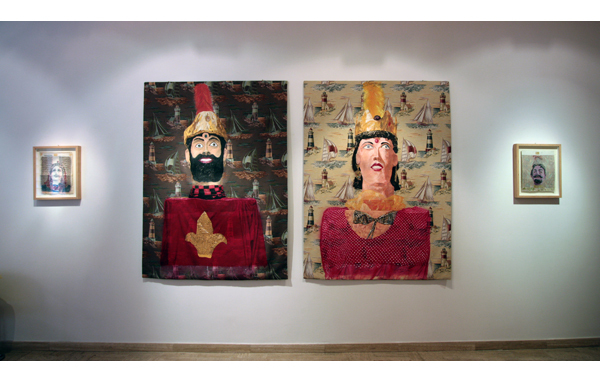 In Zampogna's work, the two giants seem to appear on the fabric as if evoked by the viewer. They grow amidst the flowers in the background, mixing in with the surreal landscape they are set against. As Claude Frontisi underscores in the catalogue that accompanies the exhibit, "all the paintings in this collection, the large and the small, explore the impression left by phantoms appearing at the dawn of time; we are invited to join a waking dream, a giantomachy." "Zampogna's 'gigantic' works seem to spawn from the uncanny place where reminiscence, memory and oblivion bleed into one; here, the painter's subconscious self can come into contact with frighteningly suggestive ancestral shadows from his youth", Fiore writes of the works in his critical essay. "They slip through walls and appear as visions, inspiring the artist and leaving their likeness on his canvas. (...) The height of the posing giants seems to taunt the proportions of what we know as real. It seems to suggest that only what leaves its mark on a canvas can be considered real, and that real is only what we know not to exist." Gaetano Zampogna was born in Scido (Italy) in 1946. He lives and works in Rome. In 1989, Gaetano Zampogna was among the co-founders of the group Artmedia, a group that intended art as a movement of "appropriation and pillaging" of 20th century works. In keeping with this, Zampogna begins his personal artistic journey by inserting photographic ilfochromatic sections into monochromatic or dichromatic pictures. 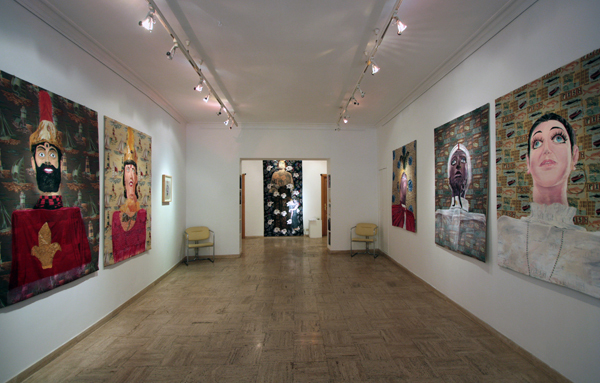 At this time, he uses the original works of artists such as Schifano, Boetti and Lewitt. In 1994, he leaves the group and begins to work on rediscovering figurative art, a style he feels has been contaminated by contemporary media mythology. At first, he works by emphasizing the weakness of a world portrayed through advertisement, as a mere product. To do this, he superimposes disturbing and displacing elements over unnaturally large, round, monochromatic faces. The superimposed elements are shots of 'momentous events worldwide' taken from the covers of the most important international magazines. They impose their presence on the faces, becoming polychromatic windows onto the world. In a second phase, Zampogna works on developing a more disturbing relationship between the superimposed image and the first image. He increases the size of the 'windows' turning them into veritable portraits and rendering media reality and reality itself interchangeable. The resulting images seem devoid of memory; the two sets of pictures communicate in strange and synchronic complicity. Advertisement and contemporary life feed into each other. In his next phase, Zampogna begins to investigate the tragic and ironic aspects of the world as we experience it. Treasure Island and the Lucky-charm Animals are icons of mediocrity that live within the narrow confines of scratch cards. They convey the illusory hope of ready-made personal wealth; they also reflect our need to find a catharsis, which is often itself mediocre. 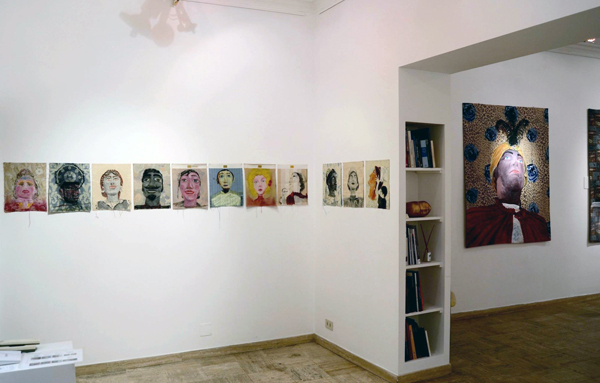 In 2009, Zampogna depicts a series of portraits of fellow artists and friends. These are monochromatic and readily recognizable, although the portraits are lightly disturbed by superimposed erroneously-phrased proverbs (one for all: two wrongs don't make a night). 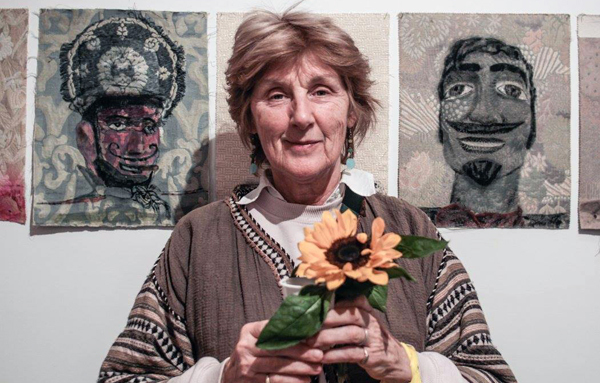 Each portrait is a piece of a larger puzzle revealing Zampogna's own relationship history. The most recent phase of Zampogna's work begins in 2010. This phase has a visionary quality to it. He stages large visual machines with two allegorical protagonists at their heart: the giants Mata and Grifone. Mata and Grifone come from Southern Italian folklore; in Zampogna's work, they seem to be evoked rather than painted, as they appear almost preternaturally on the massive floral canvasses. Their static presence turns into static drama. Through them, we can escape our history and lose ourselves in a ritualistic dimension. In them, ephemeral dreams and shadows gain a corporeal presence. Zampogna's 'gigantic' works seem to spawn from the uncanny place where reminiscence, memory and oblivion bleed into one; here, the painter's subconscious self can come into contact with frighteningly suggestive ancestral shadows from his youth. The scenes he stages represent the two mythological giants. They slip through walls and appear as visions, inspiring the artist and leaving their likeness on his canvas. 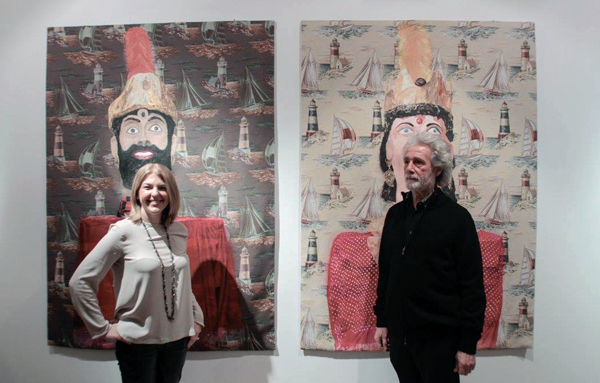 Zampogna started working with large decorated canvases in 2010. His work creates an unexpected and unpredictable dialogue between the printed canvas and his own visions, seemingly reconciling Piero della Francesca's 15th century lesson with a novel naïveté. 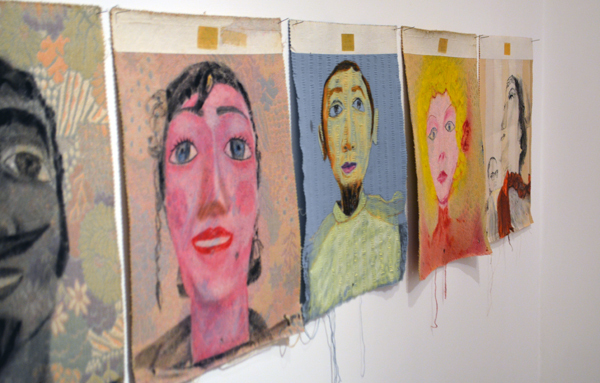 He parodies tapestries: on his canvasses those who are absent become translucent apparitions haunting the first daylight hours, when consciousness is but partial and reality only ephemeral. The height of the posing giants seems to taunt the proportions of what we know as real. It seems to suggest that only what leaves its mark on a canvas can be considered real, and that real is only what we know not to exist. When one enters Gaetano Zampogna's study, one has the impression of having slipped through Alice's proverbial looking glass or having joined the universe of George Lucas's characters; here, we are invited to leave behind the parameters of space and time as we know them. An unsettled if confident observer, the visitor can find in Zampogna's work an attempt to construct a fluid conversation between yesterday and today. He blends distant places, juxtaposes tragic and comedic figures, and parallels concrete elements with phantasmagorical ones with the deftness of the stage magician. His creative process can be compared to a photomontage or a collage; he combines images that are not logically linked and thus creates an intellectual paradox. Through it, he seems to encourage wide-ranging and polymorphic associations. In his work, the image of an immaculate Rome (and how long will it stay thus?) becomes the backdrop to a vivacious exchange between Mnemosyne and televised current events. In his study, a privileged spectator can sit at a table hosting both his work in progress and his pasta al sugo. He can then move to the bench beside the wall and enter a long debate that knows no rules and no logic. Elmerindo Fiore knows this well. He was one of Zampogna's partners in the Artmedia project and now enjoys his moment on the bench, where he smokes ceaselessly. 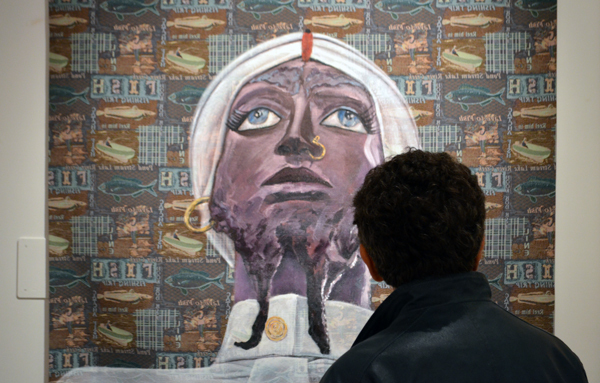 Finally, the visitor can enter the space where the paintings come into being, and fill his eyes with their beauty. 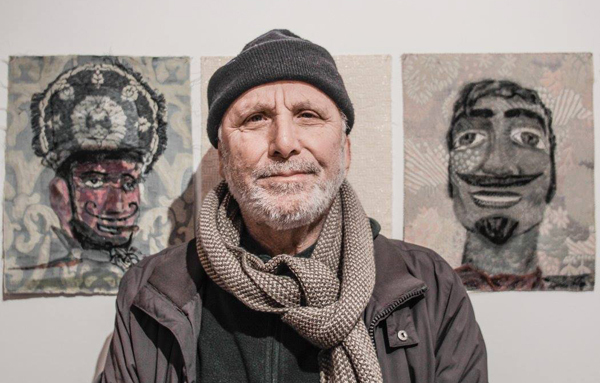 Here, one can appreciate Zampogna's technique, which stems from a combination of his in-depth study of free-hand drawing and his understanding of familial and social relations. Zampogna was born in Scido, Calabria (Italy). His early years were spent observing paper mache giants as they paraded across town during local festivals. Perhaps, that same glance crossed the Strait of Messina: it is but a breath away, after all. Here, Mata and Grifone are known to dance together across the beautiful city they allegedly founded: their dance is amorous and physical, even the youngest observers know this. His adult mind and ears are certainly still full of rumbling sounds and suggestive whispers coming from those powerful memories. He absorbed the giants' tale as he watched them move to the beat of a steady drum. Music coming from imaginary bagpipes (zampogne in Italian) enhances the noise of these memories; the bagpipes are foreign to the processions of Zampogna's youth but they become cardinal to his vision. These sounds underlie the a-temporal images he proposes today: they enliven their su-realism, their corporeal nature, and their imposing presence. 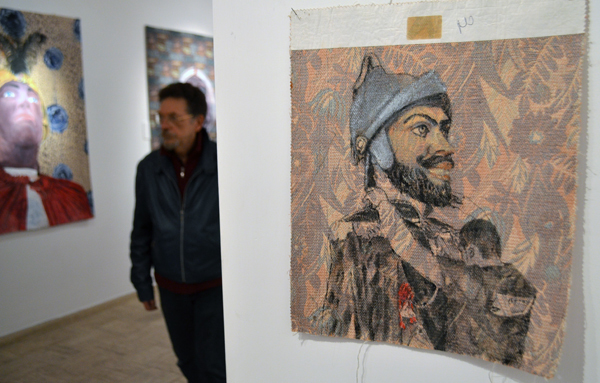 The walls in his study (3 meters high) are almost entirely covered with large pieces of painted fabric. They hang there, frameless; the well-read will recognize in this a nod to the French Support-Surfaces. The fabric itself was originally intended as upholstery; it thus looks 'readymade' and cites contemporary, post-Duchamps art. The paintings, however, transcend the material on which they are executed. They seem to feed on the medieval tradition of 'flowery' upholstery. The giants Mata and Grifone spring from this background along with their kind. Some are on horseback resembling giants painted by Paolo Uccello; others come forth on foot, exuding rigid serenity in their proud and plump forms; Mauro the bearded, instead, grins at his audience, half-mocking and half-pacified. They are sided by human-sized assistants and musicians (drums; clarinets; flutes; trumpets) who are as unreal as the giants themselves. Having been tossed into that timeless space they too have become meta-representational. Zampogna's art is such in all its forms and sizes. It plunges into the abyss of time and brings forth a reverie for us to share. 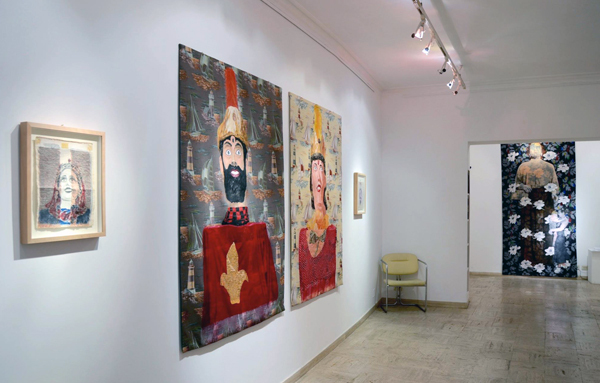 His gigantomachy is at the heart of his exhibit here, at MAC Maja Arte Contemporanea.